Any number can be perfect number in Python, if the sum of its positive divisors excluding the number itself is equal to that number. For example, 6 is a perfect number in Python because 6 is divisible by 1, 2, 3 and 6. So, the sum of these values are: 1+2+3 = 6 (Remember, we have to exclude the number itself. That’s why we haven’t added 6 here). Some of the perfect numbers are 6, 28, 496, 8128 and 33550336 so on. 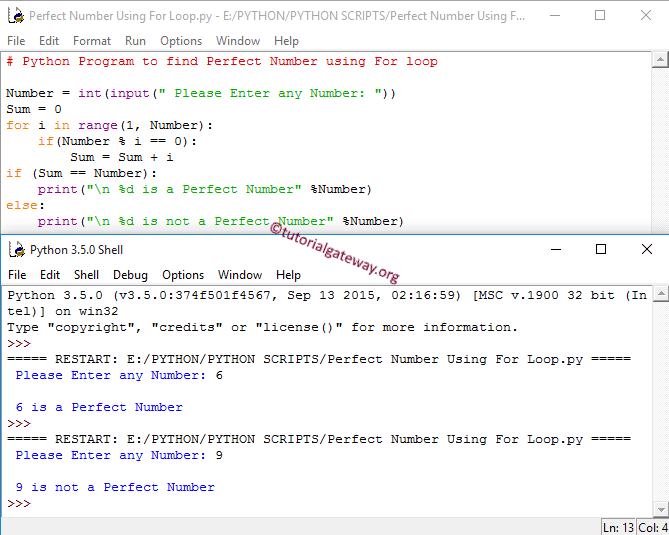 In this article we will show you, How to write a Python program to find Perfect Number using For Loop, While Loop, and Functions. 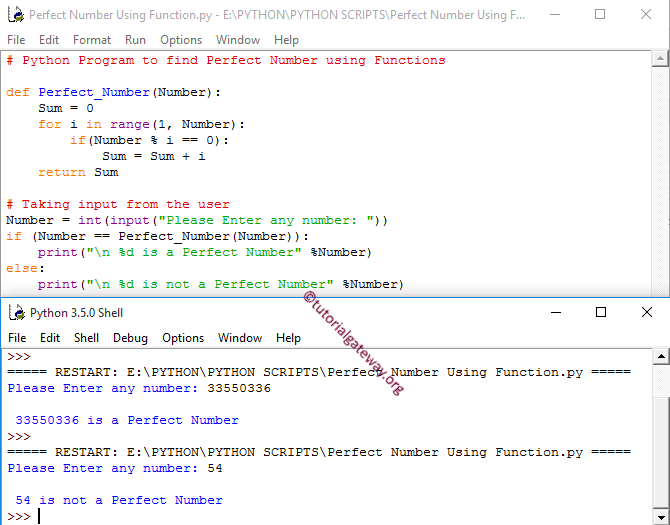 This Python program for Perfect Number allows the user to enter any number. Using this number it will calculate whether the number is Perfect number or not using the Python For Loop. Next line, We declared integer variable Sum = 0. Next, we used the for loop with range() and we are not going to explain the for loop here. If you don’t understand for loop then please visit our article Python For Loop. So, compiler will terminate the for loop. In the next line we have If statement to check whether the value inside the Sum variable is exactly equal to given Number or Not. This Python perfect number program allows the user to enter any number. Using this number it will calculate whether the user input is Perfect number or not using Python While loop. We haven’t done anything special in this example. We just replaced the For loop with While Loop and if you find difficult to understand the While loop functionality then please refer Python While Loop article. 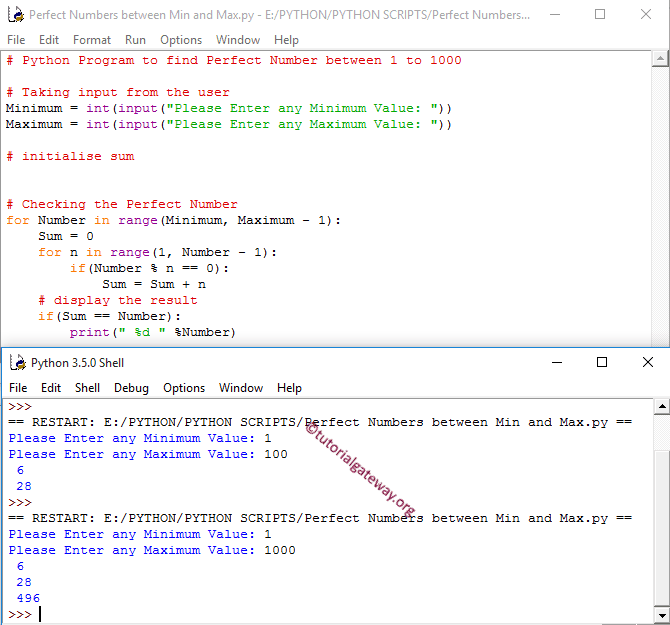 This program for Perfect number in Python allows the user to enter any number. Using this number it will calculate whether the number is Perfect number or not using the Functions. If you observe the above code, We haven’t done anything special in this example. We just defined the new user defined function and added the code we mentioned in For loop example. This Python Perfect number program allows the user to enter minimum and maximum values. Next, this Python program will find the Perfect Number between the Minimum and Maximum values. Within this Python perfect number program, this For Loop helps compiler to iterate between Minimum and Maximum Variables, iteration starts at the Minimum and then it will not exceed Maximum variable. Inside the for loop we are checking whether that number is perfect number or not. We already explained the for loop iteration in the first example.